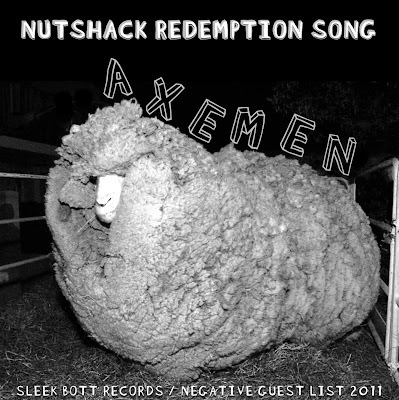 As you well know New Zealand's coffee wine chuggers The Axemen will be headlining this weekend's NGL "Polka Before the Apocalypse" festival. To celebrate, we offer our first ever (and probably last) split label release. It is called 'The Nutsacker Suite' and it's catalogue number is Sleek Bott/NGL1. You get a live @ WMFU track on the a-side entitled "Nutsack" that stammers w/ a stoned 70's hard rock feel, and a B-side called "Nutshack (Redemption Song)" that sounds like it's from another planet. Well, I 'spose Christchurch kinda is! 300 copies, hand-coloured artwork (by the band, not me). I will have under 100 copies of this record, so direct orders are limited to Australian customers & stores only. The rest of the planet can score it from Easter Bilby records or the band themselves shortly. Finally, to cap off this post-heavy day and put my filthy fingers (I am back at the fertilizer plant, see?!) to rest, here are some recent reviews from the estimable Siltblog from our recent catalogue, penned by Mr. Gourmet himelf, Roland S. Woodbe. Who amongst us is not yet a fan?